It is pointless to mention that Facebook is number #1 social media website in terms of traffic, performance and appearance. Over the last few years, there is a huge amount of increase in the number of users which is a positive sign for bloggers like us. Facebook is like a big online ocean from where we have to collect pearls ( Viewers/Customers ) interested in our niche project and that too for free without any paid ads. Well for this task, we have three options. Either we can choose profile, pages or groups. It will waste of time and energy if we use profile to promote our business. Why? Because there are certain limits and strict rules you've to follow. Moreover we can't target more than 5000 audience as there is a limit of maximum 5000 friends per account. So don't ever think to use profile as your primary choice. Now we're left with 2 options only i.e pages or groups. Pages are good to drive traffic and hits to your web-pages but you need to have more than 50k likes on your page which again is impossible to archive and not atleast from newbies. On the other hand, groups can be a way for you to drive huge amount of instant traffic with no hard work. But how? This is what I am going to discuss here. Most of the people think that Facebook groups are of no use as they have very less active users and they aren't indexed in search engines so you can't get continuous flow of traffic. Yeah I agree with these things but still groups are very important and plays a major role in success of every online Business. Now lets see how they are helpful? The first thing you have to do is to join as many groups as possible. Keep one thing in mind that you're joining those groups which are related to your niche interest. It will be of no value to join "computer tricks" if you've niche of "web-development". So be sure that you're joining right groups. After searching these terms, collect those groups having 20k+ active members ( or atleast 10k+ ). I know it's a time-consuming and may take days or week to find such groups but you need to work on this for one time only. Finally short-list all selected groups and join each of them. First of all, find your Niche Interest and collect all keywords related to it. 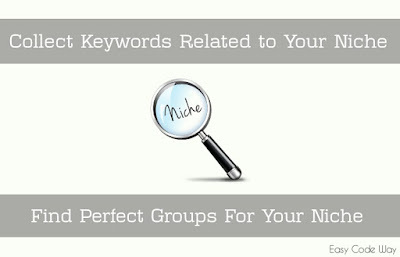 Search keywords or combination to find perfect groups with 15k average members. Join all of them and wait for approval. Again short-list those in which you've permission to post. It is very important to choose perfect groups in your niche otherwise you will be one if those people who says that "Facebook Groups are useless for marketing". Don't be one of them. Now Imagine if I have Joined around 30 groups with average 15k members. Therefore, total targeted audience will be 30*15000 = 450000 ( or 4.5 lakhs ). Not all of the people are active members. So I am reducing 50% of them which will make targeted audience equal to 225000 ( or 2.25 lakhs ). Moreover we also know that the feed preference of group posts is always less than that of your friends or page posts. So I am again reducing it by 50% ( not sure about it but approximately we can take it as 50 ). Our final targeted audience will be 112500 ( 1.12 lakhs ) which is a very big value. In this way, you can estimate the total targeted audience. Now you are ready to post in groups. Although it's not a big problem. But to be on safe side, we've to follow all Facebook policies. It's getting smarter and tight day by day. So to be away from penalties, I have listed few tips, tricks and guidelines for you. Be sure that you're all following all these. If you care about your real account, I prefer to create a new one in your own name which you don't care even if you lose it. It's obvious that you are struggling to promoting your website or links (posts ). 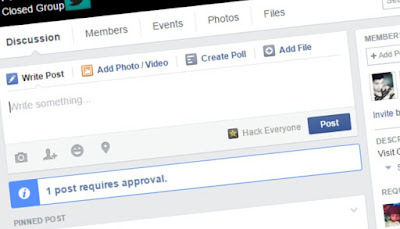 There are chances that Facebook may display a spam message whenever anyone visit your links. It happens when you continuously post it for a long period of time or you've real spam link. Facebook is serious in these matters as they are the main cause to ruin other users experience. Did you think that it will allow you to do so. Definitely NOT and in return you may be penalized by temporary or permanent disable of account features. We should avoid such things that may cause Facebook to review our account. For this purpose, you can shorten your links with google goo.gl URL shortner and you should post in limit ( discussed below ). Although link preview is good to attract audience as it contain eye-catching image and description but to avoid Facebook Penalties for spam links, you should avoid to show link previews. Post in Limit! Should I do so? If Yes then How? Most of the people ask me whether they should post in limit or not and if Yes then what is the stable limit? The answer is clear and of no doubt. You should limit your posting habit. In hope of getting more attention, many people share too many posts. This is where they did big mistake and chances are, they will be banned in future. So to be safe, only share 1 post in 2 days. Don't be so hungry. Sometimes faster become slower. It's normal that one day Facebook will show you a warning message. In such conditions, you should be more keen on how to make Facebook feel that you're not spamming. Just shutdown your all account activities and make yourself engaged in other work. How Your Post Should Look Like? After reading this heading, you may be wondering about, why we need to work upon post appearance? Well It's a fact that "First Impression is the last Impression". So to attract more people, your post should consist of eye-catching description, link and photo ( optional ). Use your targeted keywords inside description and ask questions in it. It will work as bait and surely you'll get more click on your webpages. This also reflect your emotional marketing value. Note: Your description should not be more than 250 words. This is because, long description will hide your link and also busy people have no time to read it all. So keep it short and clear. In this way I used to drive huge amount of instant traffic via Facebook groups and now it's my first priority. All these things work for me and its for sure that they will also work for you. Just follow all these tactics carefully and work hard ( in smarter way ). Hope that everything is clear to you. If you have any questions or doubt, please let me know in comments. Did you find any boost up in your traffic after using this trick. Let me know your story. I am glad that you enjoyed the article. Stay tuned for more interesting tutorials. Love and blessing! Wonderful article. 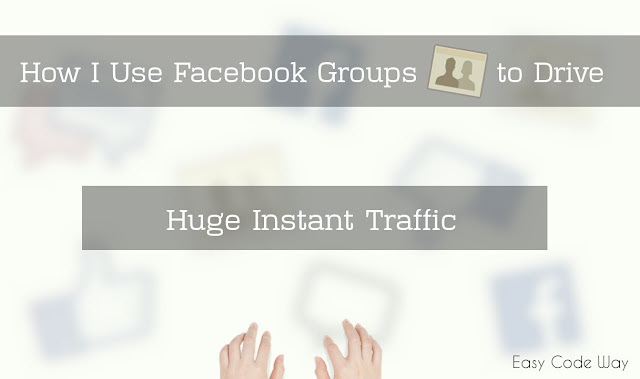 Facebook groups are really important and effective to get instant traffic. All the groups here are excellent. I have already joined some of these groups. Thanks for your article.